Greetings Potential Scotland 2018 Tour Participants! This is the final reminder that Scotland 2018 chaperone applications are due tomorrow, Tuesday, August 1. The application is linked below and is completed and submitted entirely online. Applications will be reviewed and decisions will be made and communicated by the end of August. Tour deposits from chaperones will also be due by September 1. The following information was originally sent on July 10, 2017 and is provided again for your reference. (All Scotland 2018 emails are also archived and available via the "Archives" link in the header section above. 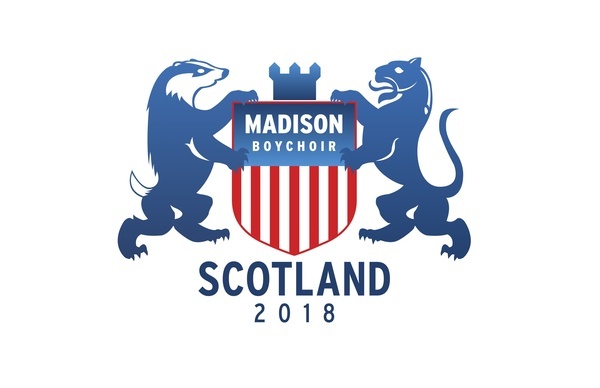 We have finalized the cost of the 2018 Scotland Tour as well as our travel dates. You may recall from our meeting in June that we presented a range of $3,100-3,450. We are happy to report that the total price of the tour will be $3,200 per participant. This includes everything: air and land travel, meals, lodging, festival fees, rehearsals, music, tour wardrobe, sight-seeing admission fees, etc. The only thing it does not include is pocket money for a souvenir! Our travel dates have also been finalized: We will depart on Thursday, July 26, and return on Sunday, August 5, 2018. With this information finalized, the time has come to ask for commitments and tour deposits. Please click on the Tour Commitment Form linked below, print, read, sign and return to the MYC office along with your $200 tour deposit by Friday, September 1, 2017. This is a firm deadline. If, by September 1, we have not received commitments from enough singers to conduct the tour, this amount will be refunded. Based on the initial level of enthusiasm, we do not anticipate needing to cancel! We will be VERY LIMITED in our ability to add passengers after September 1 and individuals wishing to join the tour after this date will most likely incur additional fees. If there are extenuating circumstances and your family is absolutely unable to pay the required $200 deposit by September 1, please contact the MYC office to make other arrangements. The Scotland 2018 Financial Assistance Application is now part of the MYC tuition assistance application linked below. You will have the option of listing your singer and choosing "Scotland 2018 Tour" in the choir drop-down menu (keep scrolling to the bottom). The deadline to apply for tour assistance is September 1, 2017. Applications are reviewed confidentially and families will be notified on or around November 1. Once your deposit and commitment form have been received by MYC you will be added to the tour roster and receive a confirmation email from us. Yay! In the coming months there will be many things communicated to you and we will do our very best to be clear and concise. We are counting on you to be careful readers and to pay special attention to all deadlines we publish as these will largely be dictated by our travel vendors and we are subject to their terms. HINT: when you see "Scotland 2018" in your inbox, please open and read! If you were not able to attend the June meeting please visit the tour website and read through the FAQ section. Once the tour roster has been set (after September 1) only those committed to the tour will receive tour-related emails. Thank you for your patience with our emails if you have decided not to travel with us. They will eventually end!